As New Media Campaigns has begun working more in the e-commerce space, we have primarily been using Magento as our platform. Although Magento is very powerful and easy for clients to maintain, its complex code-base can make customization quite difficult. We thought we would share the code for one recent feature we created for a client of ours. 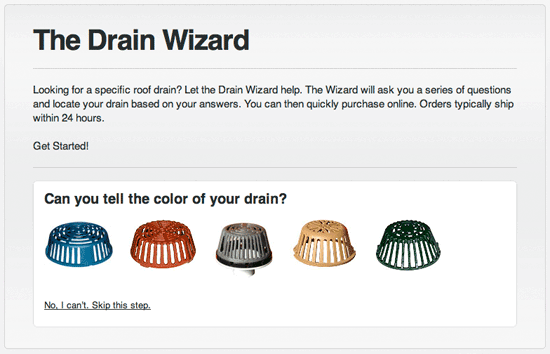 Hy-Tech Roof Drains wanted to feature a "Drain Wizard" prominently on their new website. This would be a step-by-step process to narrow down the compatible parts based on whatever information someone knows about their roof drains. We built this for them as an AJAX script that operates within a single page. Go check it out, and then I'll explain how it works. Finally, the list of available options is passed off to the drawStep() function, which matches them up with the data in our array of steps to generate the HTML. Now, the really interesting part here is the template that generates a JSON object of all the projects that meet a set of criteria. We can use Magento's product_collection model to get and filter all the products in our catalog. In our case, we are filtering by both category (since we only want to get drains, not accessories or other types of products), and by the attributes that we pass in as a query string. Enter the following PHP code in a new file in your templates folder. I chose wizard/list.phtml. Change "wizard/list.phtml" to whatever folder and filename you saved the PHP code as earlier. You can test it out by visiting the url of the page you just created. For instance, if the page's url key was wizard/list, you would point your browser to http://domain.com/wizard/list?color=green. You should see a JSON string of the green products in your catalog. That url should also be set as the end point of your AJAX request. There are several other pieces that go into the Drain Wizard, but they are more closely tied to our specific implementation. Check the source of http://www.hy-techroofdrains.com/drain-wizard for details or, better yet, contact New Media Campaigns for your Magento project. We would love to work with you! having trouple getting this to work! Thanks for the code! I tried it on my site but it wouldn't work for my Magento 1.8.1. I then made some research and found that one of the modules installed in my store can create ajax filters (improved layered navigation by Amasty).